The extension of production at all levels of society, and the parallel expansion of conflict into new forms of warfare, progressively forced architecture to abstract its technical representation into a set of calculable points and to reduce its own mass to a naked frame. In order to strenuously commensurate its apparatus of capture upon the progressively immaterial sources of value, the architecture of production turned in an isometric defensive system, infinitely reproducible like a mise en abîme of Typical Plans. 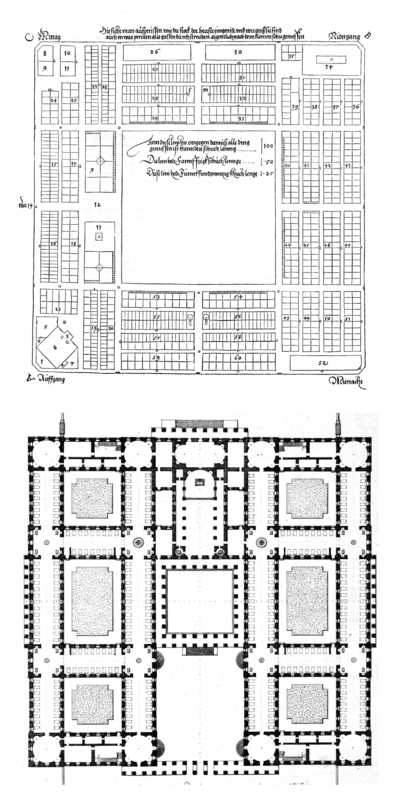 The rise of such isometrical language could be traced back to the very first treatise of architecture by Vitruvius, in which the analytical disposition of objects through plans, elevations and sections was explicitly related to the military procedures of surveying the battlefield, layouting the camp and ordering the legions. For a soldier-architect as Vitruvius there was a sharp distinction between reason and ingeniousness. While ratio mostly referred to a static knowledge based on a superordinate set of rules and proportions, sollertia alluded to the deepest human ingenious faculty, synthesis of cunning intuition and pragmatic thought, which could be attained only at war: conflict constituted both a source of technical innovation and a trigger for a scientific investigation of reality. In its Renaissance reception, the Vitruvian machinatio was productively transformed into operative diagrams of organization. The evolution of artillery required a prompt measurement of the fire- trajectories and an accurate survey of the opponent forces, to strategically modulate the line of bastions and to rearrange the urban fabric accordingly. The symbolical and subjective vanishing- point of the costruzione legittima was thus gradually replaced by the neutral objectivity of the axonometric view, constructed by dissecting reality into orthogonal projections, and by posing the view-point at an infinite distance. Typical Plan, in its tautological reiteration as nth plan, is intrinsically axonometric. Conceived as an abstract device which constantly develops by absorbing and framing the inner and outer struggling pressures of its own ‘content’ without restraining its productive potential, it definitely embodied the diagram of the late capitalist exploitation. Therefore this essay would be an attempt to retrace a prehistory of the Typical Plan from the Vitruvian machinatio and its Renaissance reception, between the two paradigmatic ‘projects’ of Francesco Di Giorgio Martini and Archizoom Associati. This presentation assumes that every theory of architecture is an attempt to define the common in architecture–the irreducible elements common to all architecture–and to provide an account on the genesis of individual architectural objects. This does not mean that every theory is able to grasp the common adequately: while it is very difficult to define what is common in architecture itself, it is easier to apply a set of universal rules upon architecture. Typology, in its first and third historical occurrences, will be seen in its contradictory relation towards the common. In the eighteenth century typology provides the solution to the anxiety caused by the discovery of the arbitrariness of our understanding of formal beauty. Typology substitutes the authority of the ancients as a veritable basis for the choice of architectural forms. Typology, as a catalogue of forms agreed upon and the rules of their composition, is the architectural social contract providing the necessary institutional framework for the production of architecture. Parallel to typology–the catalogue of regular, admissible forms–the eighteenth century seems obsessed by monsters. Monsters are those forms which exceed the table, that cannot be comprehended and explained by it. Monsters destroy and invalidate typology. Yet, monsters can be (temporarily) tamed, and provide the basis for the construction of new institutions on the ashes of the old ones. Introducing typology as an antidote against the Italian bureaucratic town planning of the post-war years, Rossi cautioned architects against reducing typology to another set of rules and procedures. On the contrary, Aldo Rossi is interested in showing how the mechanical reproduction of found architectural forms can produce monuments, ie. emergent properties that escape the codified order of power and produce difference as the main constituent of the city. In this sense, his unfinished project The Analogous City can be seen as an attempt to elaborate a science of the unpredictable genesis of urban individuality out of determined architectural materials.